it had a developmental production in Soho Think Tank's Ice Factory Festival in 2007.
it had a musical score by Rachel Peters & was directed by Emma Griffin. New Georges produced it at The Living Theatre with the same team in 2008. 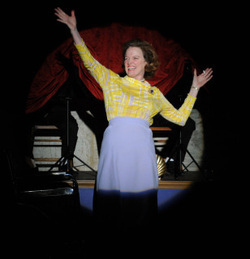 People's Light & Theatre in Malvern, PA, produced it in 2010; it was directed there by Daniella Topol. Listen to an excerpt featuring the incomparable Kristin Griffith, with sound design by Natalie Johnsonius Neubert, for Necessary Exposure: The Female Playwright Project. It's published by Playscripts. Or find it on the New Play Exchange. photos by Jim Baldassare. top: Kristin Griffith, Brian Gerard Murray, Eric Clem; bottom: Kristin Griffith. New Georges, 2008. "Her characterization seems honest and real... we get a feisty, salty, opinionated and highly knowledgeable woman, utterly unsentimental and altogether human." above: Alda Cortese People's Light & Theatre, 2010.